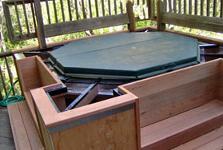 Michael Childs - Hot Tub project, artist, custom woodworking, writer, South Pasadena, California. 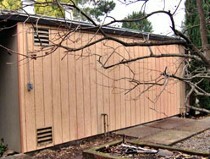 This job started off being a small job. 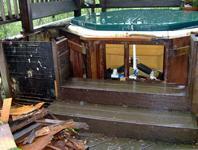 "There appears to be some dry rot in out hot tub enclosure. 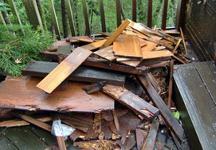 Would you check it out, please?” I pulled one plank off, then another, then some plywood: the wood just disintegrated under my tools. Pretty soon it was a big pile. 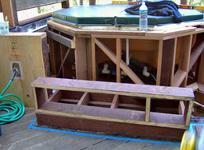 I had the challenge of keeping enough structure intact to keep the tub from falling or moving. On the other hand, It was a challenge of removing the wood with nails firmly embedded in old wood, on deck rafters 40 feet up on the air, because of the steep terrain, and barely 6 inches of room to muscle a crow bar. Not only did we remove almost every piece of wood, we had to remember how to put it back together. Notice how we blocked up the hot tub as we worked on the supports. 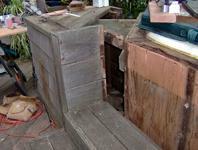 The stairs on the stair surrounds had to be replaced. We also saturated the joists with epoxy to slow down any remaining dry rot. 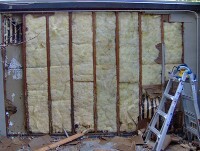 Notice how we covered the internal structure with waterproofing material to prevent rot.